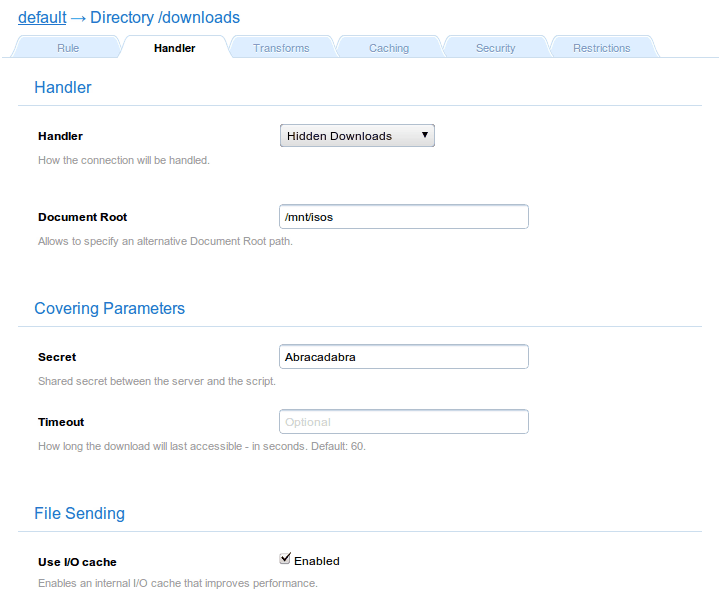 The Hidden Downloads handler implements secure download mechanisms. This module allows to handle temporal URLs to serve hidden files. Required. Share secret between the handler and the script. Optional. How long - in seconds - the URL will be valid. The idea behind this handler is plain and simple. It will only serve a file if the URL has been generated by a dynamic execution script that you’ve previously written. If the script allows the user to access the file, it will generate a special encoded URL that Cherokee will handle through the Hidden Downloads module. If the URL is invalid, is modified, or expires, Cherokee will not serve the file. It is important to notice that the URLs are only valid for a period of time. If an URL expires, the server will return an error instead of the file contents. By default URLs last 60 seconds. Please note that both sample implementations count on having an URL that starts with /. Lets imagine you have a few ISO files that you want to distribute among a certain group of people. First, and most importantly, the ISO files ought to be outside of the WWW directory root; otherwise, anybody would be able to download them. Let’s imagine those ISO files are located under: /mnt/isos/, and the server document root is located in /var/www/. Since the /downloads web directory is configured with this "Hidden Downloads" handler, it will check the URL to ensure that it is valid and has not expired. Then, if everything was right, it would send the /mnt/isos/bar/foo/example.iso file to the client.